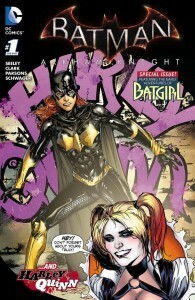 Part of the Batman: Arkham Knight line of comics, Batman: Arkham Knight Batgirl & Harley Quinn Special is quite a mouth-full of a title. It’s also a one-shot comic that promises origins and adventure and gets a little muddled somewhere in between. The premise is strong through the parallels it creates in its two main characters. Barbara Gordon and Harleen Quinzel have something in common: Barbara only recently put on her cape and cowl while Harley only recently fell for the wiles of the Joker. 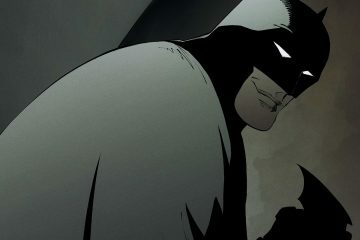 And while the Dark Knight is refusing to engage Batgirl and making a point to discourage her, Joker is making a point to encourage the young intern that’s fallen in love with him. When his manipulation of Harley fails to get him moved from intensive lockup in Arkham Asylum, she takes it upon herself to stir up some trouble in Gotham in the place of her Puddin’. When a circus rolls into town it’s the perfect place to reveal Gotham’s newest villain and for its newest hero to stop her. It’s a story often told in regards to Harley Quinn: her origin. She seems to be the centre of attention when it comes to changing around her story and the changes have been anywhere from little tweaks to huge, ridiculous exploits. At this point, including her origin story in a comic is a moot point, we all know why she becomes Harley Quinn, tell us a new story already! Seemingly her origin changes are just done to give her a new costume; and this story is no different. Surprisingly the costume they designed for her this time around isn’t terrible. It’s classical Quinn inspired, still a lot of skin showing, but her chest isn’t hanging out, it’s black and red, and she’s got a jester headdress so it’s not as far gone as some things she’s been put in. The art in Batgirl & Harley Quinn, much like the story, leaves something to be desired. It’s bright with no harsh shadows or washed out or muddied colours but the character’s faces have little to no emotion on them. Especially the eyes which are blank, glassy, and completely flat. There are large patches of cross-hatching that seem to be used as place fillers for finer details that never come and there are panels that could have been executed better to add more effect to the visual storytelling. There are four panels side by side where the only thing that changes is which way Barbara’s eyes are looking. With nothing else to go on, whatever those panels are trying to tell us gets lost. Wait and See. It’s always nice to see Batgirl in the limelight and Harley Quinn’s costume is the best design there’s been in years but this Batgirl & Harley Quinn Special isn’t that special yet. It isn’t the most original story and the art ranges from mediocre to disappointing, but I think overall it has promise to be a good Batgirl story. Maybe even a good Harley Quinn story. It just depends on how it’s executed from here on out.